*Actual On Road Price of Hero Glamour at the dealership may vary. The new Splendour and Achiever models have re-ignited the spark in the company and Hero MotoCorp hopes that the new Glamour will do the trick in the 125cc segment. 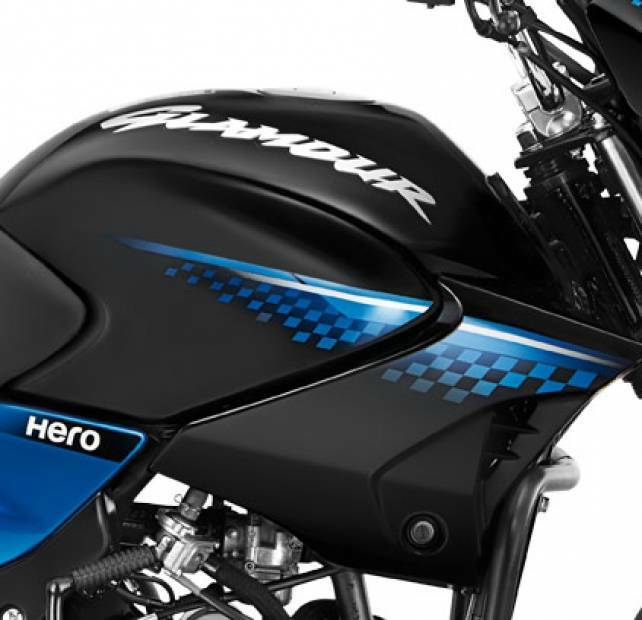 The mid-sized commuter fighter from Hero MotoCorp has been around since 2005. In its itinerary so far, the bike has undergone various modifications. Available in two variants- drum brake and disc brake, the bike derives power from a 125cc engine mated to a multiplate wet constant mesh transmission. Suspension set up consists of telescopic hydraulic shock absorbers in the front and swing arm hydraulic shock absorbers at the rear. The body wears dual-tone colour theme featuring black and a contrasting colour. On the other hand, body graphics add a sporty flair to the bike. The compact headlamp in front goes well with the body painted mirrors, black finished exhaust, alloy wheels and contrast coloured body panels. The fit and finish is good and makes the bike look up-market. Power is drawn from 124.7cc, air-cooled, 4-stroke, single cylinder engine generating peak power of 9bhp at 7000rpm along with top torque of 10.35Nm at 4000rpm. The carburetted engine features the ASFS advanced swirl flow induction system and comes mated to a 4-speed constant mesh transmission and claims to offer top speed of 90 kmph. 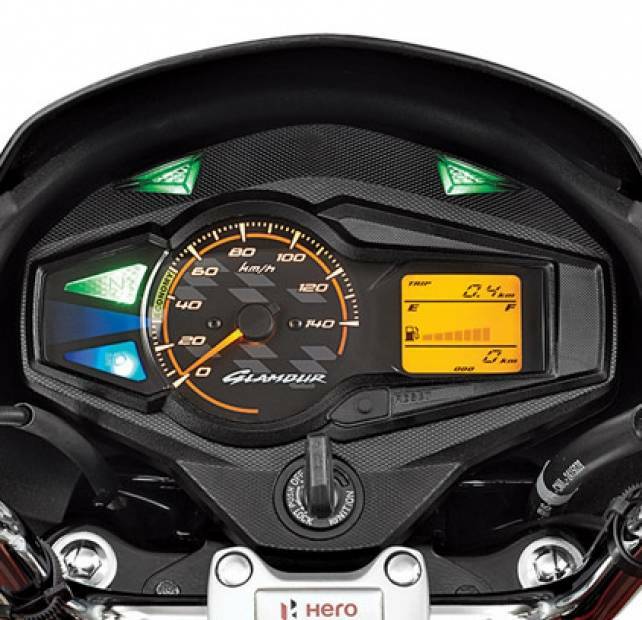 The handle bar gets digital-analog combo meter console, a large speedometer, LCD display, tripmeter, odometer, fuel meter, switchgear, and scintillating new graphics. Aerodynamic scoops can also be seen around the fuel tank and the rear panels. As mentioned in the beginning, the bike is available in two variants, one is the dual drum brake variant which features internal expanding shoe type 130mm drum brakes, whereas second variant comes with 240mm dics brake in the front. Glamour rides on 2.75 x 18-42 P/ 4 PR tyres in front and 3.00 x 18- 52 P/ 6 PR tyres at the back. The mid-sized commuter from Hero MotoCorp faces competition from the rivals such as Honda CB Shine and Bajaj Discover 125. It is good but moving 50 speed backside of headlight is vibrating and loose the parts of backside headlight. Super bike new glamour millage best. Really good bike new glamour millage best.i am buy the bike is the very best.